Police officials in Los Angeles served a search warrant on an elaborate indoor marijuana garden (pictured) just 25 feet from the back door of the Topanga police station. 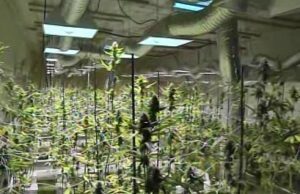 Officials found 850 marijuana plants, grow lights, and an automated irrigation system. An investigation was launched after police smelled marijuana from the station parking lot adjacent to the industrial building that housed the grow site. Investigators also discovered an unusually high electric bill to secure a search warrant which was executed Wednesday afternoon. Police also admitted the grow had been there at least 8 months despite being so close. Officials say the growers installed a new ventilation system and used insulation material to seal cracks in the building to try to eliminate the smell of the 850 high grade marijuana plants which proved unsuccessful. Three people were arrested, though their names were not immediately available. All face multiple narcotics charges and endless “dumb criminal” mentions on T.V and blogs for years to come. Subscribe to Spark Report via email or RSS Feed. You can also find SR on Twitter and Facebook. “Dumb criminals”??? More like dumb cops, how does someone grow that much pot so close to the station? The cops are dumb, not the farmer!! Spark Report's new weekly digest of the best cannabis content. Copyright © 2008-2019 Spark Report. All rights reserved.